Previously we have been using variables with CSS preprocessor like Sass and Less, now variables have been brought in native CSS using the custom property. 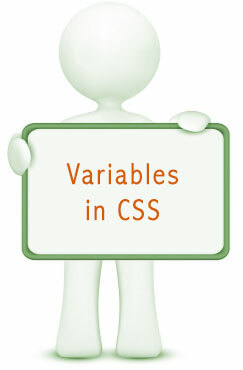 We use variables in CSS to store color, layout details, font preferences etc. It helps us to avoid copy, paste code and simplify the development. Preprocessor variables vs native CSS custom properties – variables. Preprocessor variable cannot be change dynamically. Preprocessor variables are not aware of the DOM structure. What if the variable has not been defined in custom property? A substitution has to be used similarly as we use in font stack, a comma separated list of values. If there is no value defined for the given variable, browser will ignore it and move to next value in the list. We can take advantage of the same. To set a new value on a CSS custom property use the style.setProperty method. To remove the value of a custom property use the style.removeProperty method. Contemporary browsers are all set to fly with custom property but internet explorer 11 and Opera mini are still lagging behind. A fallback plan needs to be created for the browsers which do not have support the custom property. @supports rule allows css writer to check if a particular property declaration are supported in CSS or not. When browsers do not understand the property; they ignore and look next. We can take advantage of the same. Post processor plugin for browser compatibility of custom property. Post-processor plugin converts the custom properties into plain CSS. This is a fallback plan for custom property, something similar to polyfill. Start using the CSS custom property as browsers are not barriers, there are many way to bypass such hurdles and enjoy the technology. We just need to change our attitude towards browser. If browsers are stubborn be harder with it and take benefits of all the advantages that custom property is providing. Developing inspired guide with CSS custom properties. Previous Previous post: Balanced experience or User experience, what will be the right name?